(NEW ALBANY, Ind. 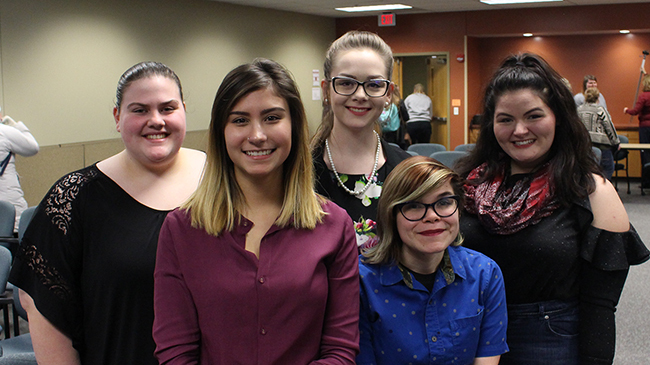 )—Bone-chilling temperatures were no match for the energy radiating from the sixth annual Voices of Change speech contest, held Wednesday evening in University Center North before an audience of faculty, staff, students, families and friends. First prize was a $250 scholarship provided through the Office of Financial Aid. “Being terrified of public speaking, I never thought that I would do so well, and I’m glad that what I had to say could touch so many people,” Cain said. Co-sponsored by the Department of Communication Studies and Campus Life, the Voices of Change speech contest was initiated by Dean of Student Life Seuth Chaleunphonh to celebrate the vision and legacy of Dr. Martin Luther King, Jr. Speech topics vary, but all reinforce Dr. King’s advocacy of peaceful social change through civil dialogue, and most seek to inspire the audience to take personal action for the betterment of themselves, the environment and/or society. The contest features exemplary persuasive speeches by the top five representatives from the previous year’s basic public speaking classes. By design, the speeches are drawn from the final assignment in those classes. The finalists are chosen over the winter break, and are given comments for revision if necessary. Three judges chosen by Rebecca Carlton, senior lecturer in communication studies, score the speeches according to criteria that align with the grading in the classes, ensuring a level playing field that accords with the speakers’ goals as well as with curriculum. According to Carlton, that curriculum hews to Monroe’s Motivated Sequence, a standard framework for speeches that requires students to master a series of steps that include grabbing an audience’s attention with an arresting opening; establishing a problem that demands attention; generating a response or solution; demonstrating the benefit of the response; and calling the audience to action. Students are judged on criteria ranging from how well they established personal credibility and communicated passion for the topic to more nuanced aspects such as eye contact, and the strategic use of pauses. This year’s judges were all IU Southeast alumni, and chosen to provide diverse campus and community perspectives: Jennifer Daniel, academic advisor in the School of Business; Bryson Mills, talent acquisition specialist at New Albany, Ind.-based Samtec and third-place finisher in the 2014 contest; and Randa Raymer, account executive at the News and Tribune in Jeffersonville, Ind. 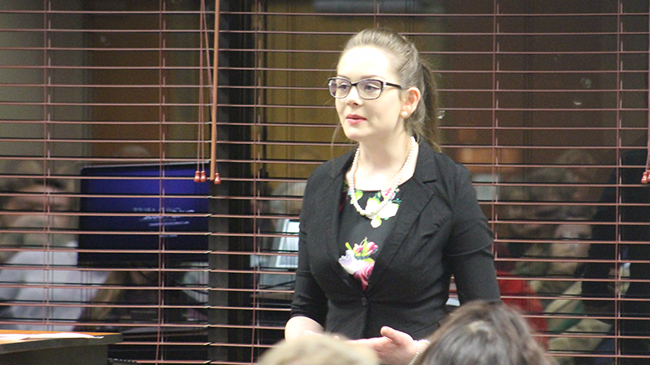 Emily Cain won the Voices of Change speech contest with a compelling presentation on child abuse. Cain’s winning speech moved through and beyond sobering child abuse statistics, exploring the lifelong psychological and emotional burdens borne by victims, before listing several actions that anyone can and should take to recognize the signs of abuse and assist those subjected to it. Rena Andrews, a psychology major from New Orleans, took the $150 second prize with a speech on cyberbullying and how to fight it. Belen Gregory, a psychology major from Charlestown, Ind., spoke on the personal and social benefits of “Giving Back: The Community Kitchen.” Her contribution won third prize, a $100 scholarship. After the presentations, while the judges tallied scores, Diane Reid, senior lecturer in communication studies and Michael Abernethy, lecturer in communication studies, regaled the audience with a selection of poems and limericks by the beloved American humorist, Ogden Nash. It’s a Voices of Change tradition that celebrates wordplay and lightens spirits in anticipation of the final outcome. Carlton sees a benefit for the event in its ability to challenge students to work toward a goal. The winners become public speaking role models for the students who come after, many of whom attended the contest as part of their current course work. Beyond that, the event brings attention to a program that is increasingly crucial in developing soft-skills that are useful in graduate school and professional life in many fields. For Chaleunphonh as for Carlton, the value of the event extends to the community, which can benefit from the ethics and impulses nurtured through the work of all the students involved.